Steroid medications, including prednisone, are often used to treat inflammatory bowel disease (IBD). One prednisone side effect that can occur with high doses or prolonged use is the development of cataracts. Cataracts are generally thought of as a condition of older persons. However, steroids can cause cataracts to develop in younger people. Unlike some side effects, such as facial "mooning," increased appetite, hair growth, and acne, a cataract will not abate after the course of steroid treatment is complete. However, if the steroid dosage is lessened or discontinued, an existing cataract may not get any larger. Cataracts are fortunately very treatable. Not everyone who requires steroids will develop cataracts. This adverse effect of steroids is well-known, however, and anyone taking these drugs should see an eye doctor on a regular basis. In the general United States population, it's estimated that 31% of people between the ages of 65 and 74 years, and 53% of persons over the age of 75 years, have at least one cataract. Congenital cataracts can occur in newborns (at a rate of 10,000 per year) but are generally the result of an infection, or drug or alcohol abuse during the pregnancy. After light passes through the pupil of the eye, it passes through the lens, which is comprised primarily of water and proteins. The lens functions much like a camera, focusing that light onto the retina. The lens of your eye can actually change shape to focus on objects that are close or far away. During the normal aging process, some of the proteins in the lens may clump together, causing an area of opacity -- a cataract. The area will become larger and more opaque over time, clouding the lens and making it difficult to see. There are three types of cataracts: nuclear, cortical, and posterior subcapsular. Prednisone, either oral or in eye drops, may cause posterior subcapsular cataracts. Nuclear: This type of cataract develops slowly, is more common in older persons, and gives the eye a yellow tinge. Cortical: This type of cataract is common in people with diabetes. Cortical cataract forms in the lens cortex, and eventually extend outward like the spokes on a wheel. Posterior subcapsular: This type of cataract may be caused by high doses or prolonged use of prednisone, extreme farsightedness, and retinitis pigmentosa. This type of cataract forms at the back of the lens, and symptoms tend to develop relatively quickly (in months, rather than years). As light passes through the portion of the back of lens with the cataract, it is scattered rather than focused. A person with an early posterior subcapsular cataract may have more trouble seeing close objects. Use of prednisone, administered in high doses or for a prolonged period of time, is a risk factor for cataracts. However, there are several other risk factors, including age, prior eye surgery or trauma, chronic conditions, and certain medications. There is no medication known to prevent cataracts. However, it is thought that a diet high in antioxidants (beta-carotene, vitamin C, and vitamin E) may help prevent cataracts, as well as other health conditions. Ultraviolet light is a known risk factor; wear sunglasses or a hat with a brim to reduce exposure. Eye trauma is also a risk factor; wear protective eyewear when engaging in activities where eye injury is possible. 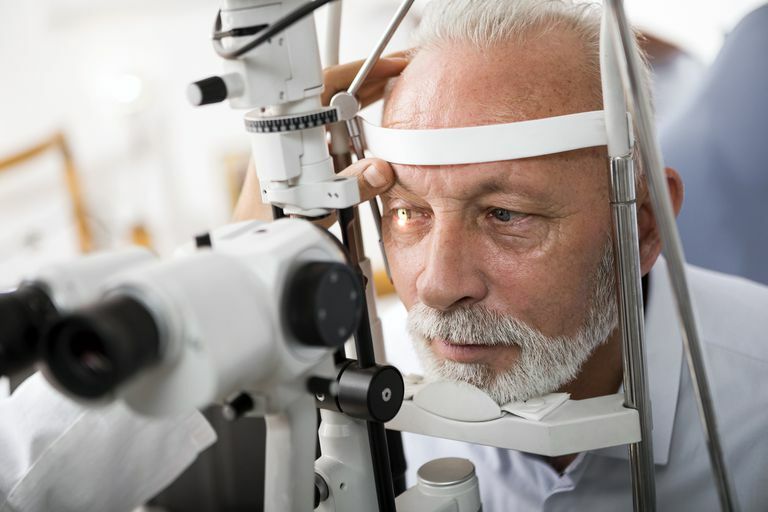 In the early stages of a cataract, sight can be improved through the use of eyeglasses, appropriate lighting, and a magnifying lens for reading or other close work. However, if the cataract progresses to a point where everyday activities become difficult, surgery may be necessary. Fortunately, cataract surgery is common and safe, with most patients reporting improved eyesight and quality of life afterward. There are two different types of cataract surgery: phacoemulsification and extracapsular. In phacoemulsification surgery, a small probe that emits ultrasound waves is inserted into the eye through an incision. The ultrasound waves cause the cataract to break into pieces, which are then suctioned away from the eye. In extracapsular cataract surgery, the lens with the cataract is removed from the eye and replaced with an artificial intraocular lens. The artificial lens looks and feels normal, though it cannot change shape like a natural lens. Persons with an intraocular lens will need eyeglasses for reading or close work. Jobling AI, Augusteyn RC. "What causes steroid cataracts? A review of steroid-induced posterior subcapsular cataracts.." Clin Exp Optom Mar 2002. 2;61-75. Li J, Tripathi RC, Tripathi BJ. "Drug-Induced Ocular Disorders." Drug Safety 2008. 2;127-141. Prouix AA. "Do steroids cause cataracts? Parkhurst Exchange Oct 2009. Ryskulova A, Turczyn K, Makuc D, Janiszewski R. "Self-Reported Age-Related Eye Diseases and Visual Impairment in the United States: Results of the 2002 National Health Interview Survey Am J Public Health 2008 March; 98: 454–461.